Last fall, you were introduced to real, live, remote-controlled cockroaches. 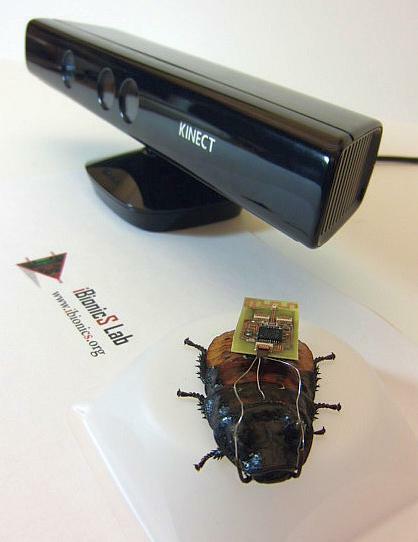 Well, the insect hackers at the North Carolina State University are at it again, this time with a Microsoft Kinect and a software program that can boss the bugs around without human input. In other words, we have successfully coopted cockroach sovereignty—and given it to the machines. The goal is to ultimately use this kind of technology to create armies of biobots capable of things bio-inspired robots can only dream of. Which is to say, if we programmed bio-inspired robots to dream. In a paper to be presented next week at the Remote Controlled Insect Biobots Minisymposium, the researchers, who received funding from the National Science Foundation’s CyberPhysical Systems Program, show how they’ve anticipated the need to put biobot swarms on autopilot. Previous research by NC State had shown it was possible to control a cockroach’s movements by wiring into its antennae and cerci, or abdominal sensory organs. Electrical impulses get the bugs to move in a certain direction by tricking them into thinking there’s a wall to the left or right, or a threat approaching from behind. Now, instead of those impulses being controlled remotely by a human, they’re tapped into the software program, which takes cues from the Xbox Kinect’s tracking data. If the cockroach veers away from the target, the Kinect observes the change and relays it to the software, which in turn makes a split-second decision about how much correctional impulse should be sent to the roach. Longer stimulation is designed to produce more drastic correction, just like pulling hard on a steering wheel. The results are pretty impressive. Their previous work with remote control yielded only about a 10 percent success rate, but the new technology has bumped them up to 27 percent. You can see it for yourself below with a roach that really seems to want nothing in the world but to turn right. If you’re at all concerned about the ethics of brain control, you can at least rest assured that Bozkurt and his team chose cockroaches for the insect’s lack of pain receptors. (Moths also meet this specification.) Bozkurt calls their research “the next level of our efforts on domesticating insects,” same as we’ve done with bees for their honey and pollination, worms for their silk, and larger animals like horses and oxen for their speed and strength. “So what we are working on is a cyberphysical way to domesticate the insects to benefit from their muscle power,” he said. And when you put it that way, I suppose I’d rather be a cockroach with an electrode backpack than a pig in a pen.